All NSW nominees who are granted a visa must update us when you first move to NSW. Permanent visa holders need to update us with their contact details for the first two years of their visa. 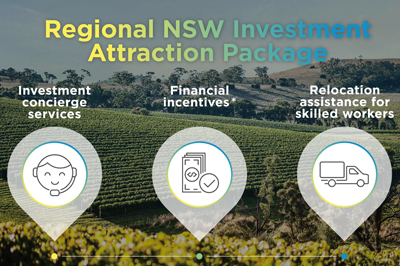 information about your business or investment activity in NSW. Business migrants should review the NSW Government Small Business Commissioner website for information about starting a business in NSW. The Small Business Commissioner provides assistance to small business, including an e-newsletter, business advisory services, online small business training toolkits, events, webinars and more. Business migrants from non-English speaking countries may be entitled to Adult Migrant English Services (AMES). Skilled migrants looking for assistance in finding a job should explore the Australian Government’s Employment services and jobs website and job search tools. NSW welcomes highly skilled expatriate Australians looking to return to Sydney and NSW. NSW Department of Industry has created an information sheet on repatriation to Sydney and New South Wales, covering citizenship, health, education, social security, tax, recognition of overseas qualifications and other relevant issues. A good way to get reconnected into business networks in Sydney and NSW is to subscribe to some of this Department's newsletters with advice on upcoming events, or look under Networking & Events. For information, resources and services to help you settle in NSW, visit the Multicultural NSW Settlement Portal. New arrivals may also want to visit the SBS settlement guide, which provides information and resources on settling into Australia in more than 30 languages. For more information on living and working in Sydney, download our booklet Living in New South Wales.